Came across this place on a long slow trek across the south side today. It’s on a side street near Halsted — 6954 S. Union Avenue, say the Internets. What got my attention was the crazy colored glass front elevation, which was clearly a 1960s design tacked onto a much older building. It’s a strange, jarring, but colorful juxtaposition. Yet, looking again, the towers share the same stone crosses as the 1960s building next door, as well as same the square glass block that demarcates so much of far south Chicago’s Mid-Century housing. 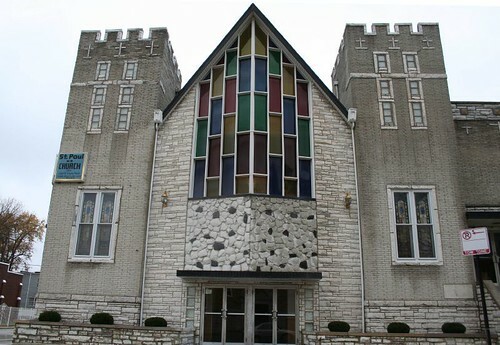 So they appear to be a 1960s job too — but there’s vintage stained glass in their windows, and an older corner stone on that facade. Very puzzling! The sign and adjacent office/classroom building look to be of the same vintage as the facade. Check out the engraved stone crosses on the building facade. 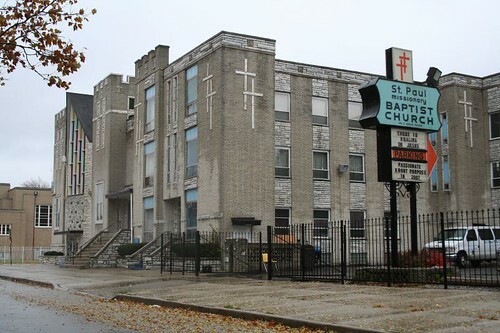 This church is deep in the hard-luck neighborhoods of the south side, so I’m sure they’ve got their work cut out for them on the missionary front. They don’t have a web presence, though they do seem to be home to the Illinois National Baptist State Convention Headquarters. ← New City YMCA… demolished.